Size: 27" x 15" x 5/8"
Raw board ready for your art! Our handcrafted raw boards are begging for your artistic flair and creative genius. Built the same as a Turbo Starter Board, this raw and blank board is ready for you. Sanded and routed smooth on all edges and faces. Apply a sanding sealer, your art creation, drill the rail holes, add grip of choice and the Creator Kit rail system. Make a truly one of a kind balance board. Our fast and light version of the Original board makes for a wild good ride. Fast, responsive and whips you in all directions. Easily control this board without tiring your legs quickly. You will love carving turns with supersonic speed and working on agility. A great starting point for small and medium sized riders and those with small feet. For all jet setters on the go, pack up this board and head to your favorite location. Easily travels in a bag or suitcase, sets up in seconds and gets you a quick workout. Great for waking up your core control before heading into competition or practice. Rail Extensions: All Starter Kits feature a urethane rail that is pieced together. You can put in middle rail extensions to increase the length by 4" or 8". The rail can also be placed on a larger board. A great way to adjust and reuse your balance board as you gain in skill and height. 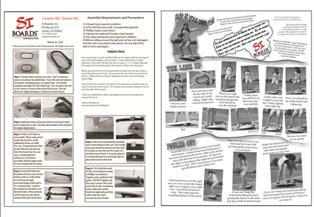 This is a great small board for small feet, kids and your personal balance trainer at the office. The board is clean and sanded smooth just for you. Anxiously awaiting your art work and handy work. A great option if you don't have access to wood or tools. And what a great family project as well! Create your own and enjoy!